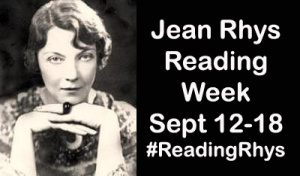 Today is the start of Jean Rhys Reading Week, a blogging event hosted by JacquiWine and Lonesome Reader. I’m joining in because Rhys is one of the (many) holes in my reading history. Up until this point, she was really just a name to me. But now… now, she’s someone I want to read again, and whom I could see becoming a favourite writer. Her use of imagery is so striking. There’s something similar to this in Voyage in the Dark where she makes excellent use of recurring imagery to heighten the feeling of exclusion from society: ‘dark houses all alike frowning down one after the other all alike all stuck together.’ At one point, the central protagonist, (Anna) feels as if she is trapped in a room where the walls appear to be closing in on her, an image which adds to a sense of claustrophobia in the book. How marvellously threatening. 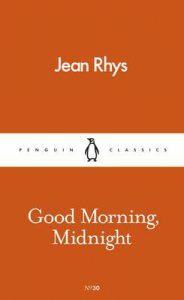 It’s a very Rhysian quote, though my iconic Rhys scenes always seem to involve a woman sitting alone in a cafe being looked at askance by people who don’t approve of women sitting alone in cafes. And yes, there is a tremendous sense of momentum in that paragraph, a gathering hostility and bare coherency.